Google's navigation menu is still not customizable. The app launcher interface allows Google to add many cool features like reordering apps, removing them or adding new ones, but for now they're not available. 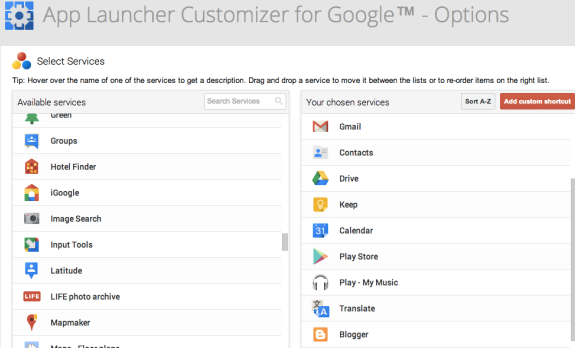 Carlos Jeurissen released a Chrome extension that lets you customize the app launcher. You can select from a very long list of Google services, including Google Scholar, Google Play Music, Google Keep, Chrome Web Store. You can also reorder the services or remove the Google products you don't use often. The upgraded launcher has up to 5 columns and as many rows as you want, but I suggest to pick less than 20 services. "In the settings page, you can define which shortcuts you want to display in the app launcher via drag and drop (hold your mouse on a shortcut in the left list, drag it to the right list, and release your mouse). The settings page also allows you to filter the 175+ Google shortcuts." My favorite feature is that settings are synced, so you can use other computers and see the same Google menu in Chrome. 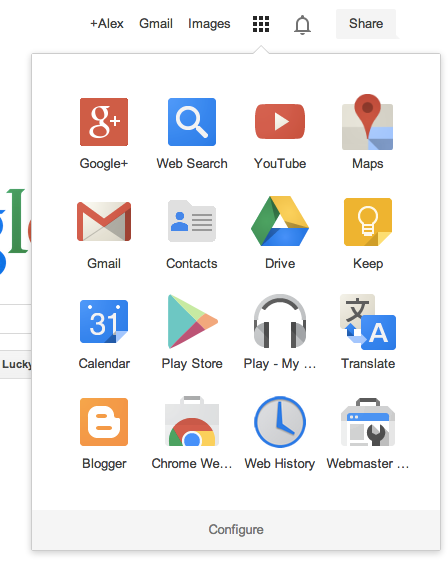 You may need to reload the new tab page after changing the menu, since Google caches it. There's also an option to add custom shortcuts, so you can link to non-Google web apps like Dropbox, Vimeo, Twitter, or Imgur.